Note: This is an Advanced Level Certification. A Six Sigma Black Belt Level II issued by The Council for Six Sigma Certification is a prerequisite for applying for this Certification. A Council for Six Sigma Certification (CSSC) Certified Six Sigma Black Belt III has a proven understanding of the entire Six Sigma Body of Knowledge through the execution of a DMAIC or DMADV Project. In addition, by having submitted an approved project, this individual has demonstrated a thorough knowledge of both Six Sigma philosophies and principles (including supporting systems and tools). The Black Belt Certification III designation also reflects proficiency in team leadership, team dynamics, and the ability to successfully assign team members with roles and responsibilities. Lastly, it indicates a high-level understanding of the DMAIC model in accordance with the Six Sigma principles, basic knowledge of lean enterprise concepts, and skills to quickly identify “non-value-added” activities. The Official CSSC Six Sigma Black Belt Level III Certification has no exam component. Instead, it requires that the individual submit a completed Six Sigma project following either the DMAIC or DMADV methodology. The project must be completely separate from any project submitted for the Six Sigma Black Belt Level III Certification. Upon payment of the project review fee of $300.00 USD (other major currency options are available during payment), an email address will be provided to submit the project for review. The project must be completely separate from any project submitted for the Six Sigma Black Belt Level III Certification. Candidates are expected to list, in great detail, the DMAIC/DMADV steps taken throughout the course of the project. Projects are reviewed and graded on a “pass/fail” basis. To successfully obtain the professional designation of a CSSC Certified Six Sigma Black Belt Level III (CSSC-CSSBB-III) issued by The Council for Six Sigma Certification, individuals must receive a “passing” mark within 1 year of registration (up to 3 attempts permitted). A Six Sigma Black Belt Level II issued by The Council for Six Sigma Certification is a prerequisite for applying for this Certification. After passing the requirements, individuals will receive an Official CSSC Six Sigma Black Belt Level III Certification issued by The Council for Six Sigma Certification, the most respected accrediting organization in the Six Sigma industry. Upon completion of the requirements, individuals are issued a Six Sigma Black Belt Level III Certification in an electronic form. All certifications contain a verifiable certification number and the certification holder is added to the Council for Six Sigma Certification Official Register. 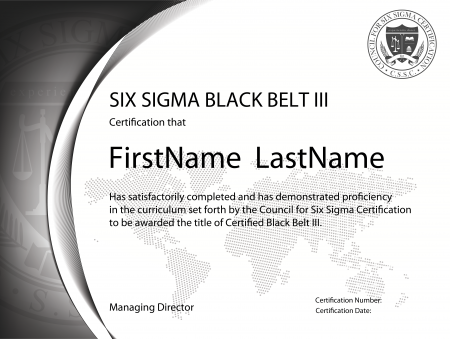 PLEASE NOTE: Prior completion of a Black Belt Level II Certification issued directly from the Council for Six Sigma Certification is REQUIRED for this registration. Enrollment for our Black Belt Certification Level III has strict eligibility requirements. This payment option is ONLY for individuals that have met the necessary prerequisites. Orders will be voided if we are unable to match your Black Belt Certification II to your account. All Black Belt Level III enrollments are manually verified.